For more information or to make an appointment to see this property call Dahan (802) 777-9799. Historic Isle La Motte. 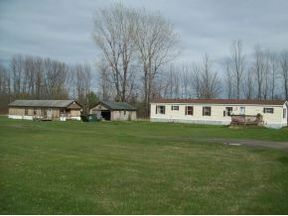 These two mobile homes are situated on a flat 9.45 acre lot, which is wooded in the rear of the property. 18 miles to the Interstate, and the elementary school is just 4 miles away. Walk to town lake access at the head of the island or Take a quick ride to the St Anne's Shrine, and the site of Vermont's oldest settlement. Western sky and sandy beach will greet you with fantastic water quality. Live in one home and rent out the other. $5,000 back at closing!